IBM distinguished designer, Doug Powell, has 30 years of experience in a range of design disciplines. He’s been a visual designer, business owners, education, community organiser, and chair of the US professional design association, AIGA. For the past four years, he’s been working as a leader with the team at IBM on a rebirth of its design program, fostering stronger design and human-centred design thinking within the organisation, as well as across its client relationships. 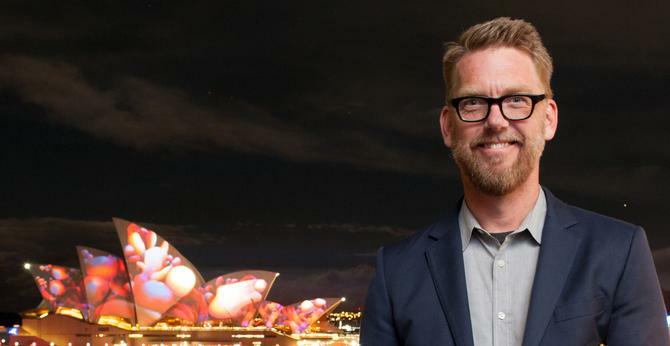 CMO had the opportunity to chat with Powell during a recent visit to Sydney for the annual Vivid Festival, to ask him about why design is so important to today’s business culture and how it’s helping Big Blue improve its own client experiences. Why are we seeing such an emphasis placed on design in business? Doug Powell (DP): It’s a great question and a fascinating one. If you look at our organisation, IBM had focus on design that goes back to the middle of the 20th century. Thomas Watson Junior, the chairman in the 1950s through to 1970s, is the one who first uttered the phrase: ‘Good design is good business’. Fast forward to the contemporary era, and we’re in an era of user experiences really driving business and product differentiation, and commercialisation for companies of all sizes and scale. We associate that with startups and companies that have a much shorter history than IBM. But virtually every business has a user of some sort, who is having an experience with a product, service, brand, space and people. Designers are the people with the expertise to build great user experiences. What is design thinking then when applied to business - is it a way of working, a culture, process? DP: Design thinking as a way of working is a great way to describe design thinking. The mission of IBM’s design program is to create a sustainable culture of design and design thinking. That word ‘culture’ is central to that. Culture is the way an organisation behaviours, works together, collaborates and the way we are in the world. Design thinking is a very different way for most IBM staff to work . For a company that has been driven by technology and an engineering mindset for most of its history, a human-centred design thinking approach is new. It’s no small task to change the behaviour and culture the size of IBM. How has that evolved in practice? DP: We have that mission of sustainable culture of change. We address that through a three-pillar formula of people plus practices plus places. With regards to people, we needed more designers when I joined in 2013, so we’ve added more than 1500 designers in the last four years. That makes IBM the largest employer of formally trained designers in the world. It’s now at more than 1700 designers today. Secondly, it’s practices. Design thinking is our way of working and there is a discipline to it. We have a customised version, which we call IBM design thinking, which takes lot of the cues of more commonly practiced approaches. The thing we need to add to it that’s not present in other practice models is the ability to scale. We are always working with very large-scale teams of hundreds or thousands of people. That’s challenging, and it’s required us to rethink the application of design thinking. Design thinking’s origins are in smaller scale consultancies, academic studios and startups. IBM has 380,000 people in 170 countries. Teams are dispersed. So there are challenges that we had to address in our practice as we built it out. Go back to 2013, and the typical IBM workspace wasn’t designed for designers – that work being deeply collaborative, innovative and iterative, and about making and prototyping. It’s also a visual practice and frankly involves making a mess as you’re solving a complex problem. We began to build those space, called IBM Studios, and we now have 42 globally. These are the places where designers are working, where design thinking is practiced, and where our clients and partners are co-creating with designers and technical teams in these spaces together. It’s a radically collaborative practice. That network is the storefront of design thinking at IBM. Can you share how this is changing the relationship with your customers? DP: It changes the DNA of the relationships with our clients. One misconception of design thinking is it’s best suited to solving problems. It’s a great methodology for that, but it’s even more important in identifying and scoping problems. It’s great for making sure the problems you are solving are relevant problems. Those are incredibly valuable questions for us to answer early on in a client relationship or new scope of work. We get clients, users and our teams together very early on in the inception of the project. By doing that, we are developing trust. And we’re working in a much more collaborative way. It’s a different dynamic than sitting in a boardroom with one person and their PowerPoint deck. We’re at the wall, elbow to elbow with each other, swapping ideas in a deeply creative mode. Coming out of that, we find clients trust us in different ways and at a different level. Having a dramatic effect on these client relationships. Design thinking is industry agnostic, and equally well applied to financial services, manufacturing, healthcare to government services. Anywhere there is a person having experience that is problematic in some way. Are there technologies aiding the application of design thinking? Or are there situations where technology actually hinders or replaces design? DP: I don’t think that’s the case. The role of designer as champion of the user and human is a vital role. We are finding some tools helping us understand people at a deeper, more intimate and empathic level. And empathy is at the core of design thinking. How do we get to know people? That’s always going to involve expertise and experience. But yes, our teams are using modern tooling to help with that. What impact are emerging technologies such as artificial intelligence and advanced analytics having on design? DP: The AI or cognitive computing space as we call it, is such a priority technology space for IBM with the Watson platform. It’s also an interesting space for designers to work in. You think about designers creating the experiences of interacting with technology: Cognitive is a whole new kind of technology we haven’t designed interactions for yet in many cases. How are we as regular people, going to interact with things like IBM Watson in 10 years from now? That’s not been invented yet and it’s a wide open space our design teams are hard at work on. There are whole sets of questions and assumptions on how we interact with technology that will be challenged, turned upside down by the answers that we come to. What are the potential pitfalls to embracing design thinking? DP: There’s a tendency and risk you get too enamoured with the practice and let yourself get bogged down by it. One core principle and requirement of delivering technology products and services in this era is that of continuous delivery. We need to be constantly delivering better and better experiences. That’s not necessarily the way design thinking was engineered originally. We need to be honing our practice to be more agile, more responsive to the changing needs of users and the market. As with any approach to building something, the tendency is it will take too long. Design thinking we’re finding is well suited to agile and continuous delivery. But left to its own devices, there’s a risk it could slow you down. What impact or influence can design thinking have on modern marketing? Can it help improve innovation and agility? DP: Design thinking is closing the gap between products and services teams and our marketers. Because design thinking is about understanding people and creating and telling a great story about them. The experience you are building is really about a story. People who are marketers love a great story. As our teams are creating great user experiences for our technical product, the stories coming out of those experiences translate really well to our marketing stories and outward-facing brand communications. We see a real synergy between design thinking and marketing. And our designers are penetrating our company in parts they never have before, like human resources, marketing, the CIO function. All now see how powerful a contribution designers can make.